535Q Cry Baby Chrome Limited Edition, Wah-Wah/Auto Wah/Filter for Guitar from Dunlop. Q control for adjusting the wah character. Has a 5 way adjustable tone switch. Variable boost control. New circuitry. Obviously an all chrome build. Very limited supply. And I may be wrong but I think these are hand made Could be wrong. I was a huge fan of the original 535Q wah, a pedal that I thought was really under the radar as a great budget wah for years. It didn't win any shootouts but for the price I think it might be one of the best ever. The original had some arguable problems with reliability, although I rarely had any issues with the couple I owned. It's a wonder to me why they aren't used by many pro's. I've heard Adam Jones uses one but who knows if there's any truth to that. This chrome edition seems a lot more solid than the already pretty reliable feeling 535q. I understand it has a revised wiring scheme to cut down on noise. I haven't heard a ton of difference. Maybe I just use good gear. My main practice rig at the moment is a Budda Superdrive combo with a medium sized pedalboard and a couple Les Pauls. Nothing fancy. I liked the original 535 for its versatility and Q control, but truth be told you are most of the time better off laying back of the controls and letting it do its thing. The Chrome version definitely comes with all the bells and whistles. You can get a lot of sounds out of it from classic and subtle to modern and aggressive. A lot of wahs seem to have their own voice but this one just sort of covers all the bases well. It's easy to get lost in tweaking for hours. There's some days when I wanna go get a teese wah and just play. But when you are looking to dial in a certain sound this thing can come in handy. It's pretty neutral overall. Doesn't impose tonally. The 535 was never the best wah or the most reliable in the world, but then again it didn't cost $270 either. And for what it's worth I never had any major problems with mine. The chrome is just a bit more and it feels to me like something that could get toured hard and still work fine. I'll be keeping mine as hopefully my final 535. The extra features are a welcome addition. This is a great design that certain players will love. If you are a no knobs guy this isn't for you obviously. But for people who want a better 535...this is it. The Dunlop 535Q Cry Baby Chrome is a wah wah pedal for electric guitar. 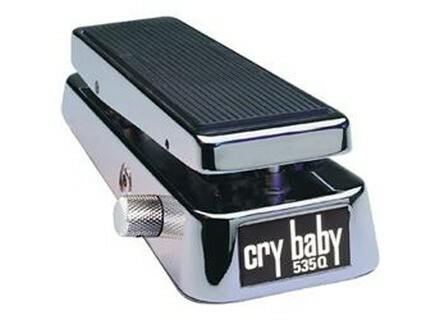 The pedal has the same make up as the 535Q Cry Baby, but is chrome. The pedal is made up of analog components and it has 1/4" connections for input and output. It has a nine volt battery compartment which is what I used to power up the pedal. This isn't rack mountable as it is a foot pedal. Using the Dunlop 535Q Cry Baby Chrome is really quite easy, although it does have a few parameters not found on standard wah-wah pedals. It is supped up a great deal with a boost parameter and well as a bandwidth 'Q' parameter. Getting a variety of tones from the Dunlop 535Q Cry Baby Chrome is definitely its specialty as it has more available tones than I've heard with any other wah wah pedal. It is really easy to use as well, so if you're thinking you might not be able to use the pedal, I really don't think that you'll have any problems or need the assistance of a manual. 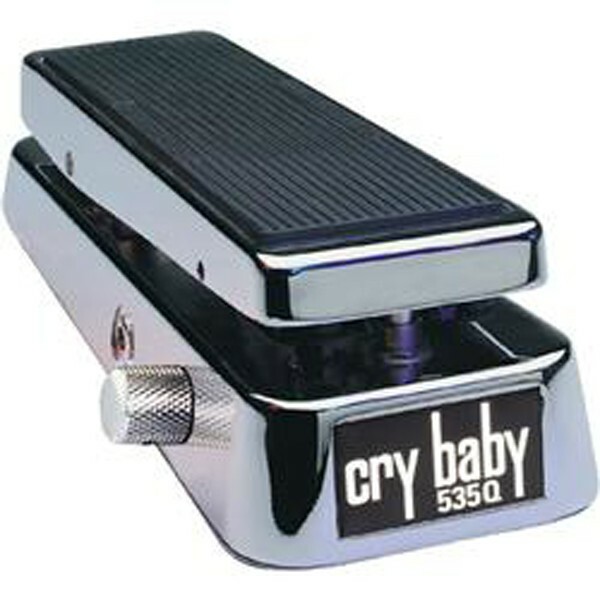 Dunlop is known for making top of the line wah-wah pedals, and the 535Q Cry Baby Chrome is probably their best model, so you can imagine the sound that comes out of this. While its basic wah sounds are comparable to the other Cry Babys, the versatility is definitely unmatched. I've used the pedal in tandem with a Fender Strat and a '76 Fender Twin Reverb for a number of different recording sessions, and thus far there hasn't been a time where I felt that I couldn't get the type of wah sound that I was looking for from this pedal. Having the extra parameters here is a real upgrade. While the Dunlop 535Q Cry Baby Chrome is certainly one of the best wah pedals out there on the market today, it is also one of the most expensive. This is really made for the player who uses wah-wah sounds all the time, rather than the occasional user. For the occasional user, the standard Cry Baby will certainly get the job done at a much lower cost, but for those who are looking for some more versatility with their wah wah pedal, I'd say it is definitely worth the price, and at least the time to check out this pedal. Wah Wah with 4-way Q selector (frequency range selection), booster with +20dB switch (on the bottom side) and two LED indicators for wah on/off (green) and boost on/off (red). Very easy to use. The rubber covering around the Q control allows you to set it directly with your feet. And it's the same for the boost switch which is ergonomically placed on the right side. The LED indicators give you visual control and allow you to check if the wah is on, in case you forgot to turn it off. All four frequency ranges provide good results. I like especially the last one which creates a strong low frequency modulation. The boost is especially useful with clean sounds to add them a bit of dirt and get a typical cry Baby tone. Turning it over 3/4 of the way will allow your guitar to cut through the music (especially good for special riffs or solos). I've been using it for 3 years for 4 or 5 live gigs per month. It has never disappointed me and it has killer looks. I often use the boost function to stand out from the band when we play louder. The wah's frequency ranges are a great creative tool. I previously owned several Dunlop, Morley and George Denis models, but I won't go back to them. Even with clogged up ears I'd buy it again!! !